Toledo viewed from Rio Tagus. Toledo is in Castilla La Mancha, Spain. A once overlooked gem, Toledo sits majestically above the Tagus River and now represents one of the most visited sites in all Spain. The history of Toledo dates back to Roman occupation (Toletum) circa 192BCE. The ruins of the Roman circus are still visible just outside the walls of the city. Roman occupation was followed by Visigoth rule, Muslim rule and finally the Reconquest of Toledo in 1085CE. Toledo was the capital of the Spanish empire until the mid 1500's when the royal court moved to Madrid. The winding, cobbled streets of the old town are often crowded with locals and tourists, as well as a surprisingly large number of cars and vans. Don't miss the 13th century cathedral or the Alcázar which sits atop the town. Denoted a UNESCO heritage site in 1986, Toledo is a worthwhile day-trip from Madrid. However, now as a stop on every day trip itinerary it often crowded with tourists, especially during the summer. From Madrid, Toledo is about 70 km southwest on the A-42 freeway, which is marked "Toledo" on all road signs. This used to be labelled the N-401, and old maps or signs may still refer to that, although almost all road signage appears to have been updated. There is often spot congestion during peak hours, sometimes as far out as Parla (25 km). Parking on the narrow cobbled streets of inner Toledo is virtually impossible except for short loading/unloading stops, but there's a big garage in Calle de Santa Úrsula, right in the centre. Buses run between Toledo and Madrid's Plaza Elíptica bus station (on the grey Circular metro line) every half hour until 21:30. The company is Alsa (old Continental-Auto). The trip takes about one hour and a return ticket costs €9.70. From the Toledo bus terminal it is a steep but picturesque 20 minute walk up to the old town. A local bus service is also available. To catch a local bus from the Toledo bus station to the center of town, head out of the station for a bit and you will see a bus stand, catch a bus going to Plaza Zocodover. Among other buses you can also catch Line 5 from the same stop which runs every 15 minutes and will drop you off right in front of Plaza Zocodover. The AVE high-speed train takes 33 minutes from Madrid's Atocha station to Toledo and costs €12.10 + €9.70 = €21.80 for a same day round trip, and you have to specify your return time at time of purchase. Be sure to arrive on time, at least 1 hour before scheduled departure time in Atocha. Boarding starts 30 minutes prior to departure and the gate will close 5 minutes before schedule. Procedures are less strict upon returning from Toledo however keeping a 30 minute margin here is recommended. In Madrid they have installed many ticket vending machines. However, be careful not to use the red vending machines called "Cercanias." For foreigners it will be easier still to use the www.renfe.es website to purchase tickets or to use the ticketing office. If you chose to use the office, be careful with timing - perhaps go the day before - because you may not be guaranteed a seat or the time you want. You can also buy tickets at the automated purple Renfe machines. You can also buy it the day before here. The only thing you can't do is select your seat though. This is convenient if you are at the atocha station if the ticket office is closed. When going through security, they will scan your bag but there is no x ray. From Toledo station, urban buses numbers 5, 61, or 62 stop on the street in front of the train station and take you to Plaza de Zocodover, the city center. The buses are 1.40 euro (pay the driver). All passengers must exit at Zocodover as it is the last stop on the route. Note: City buses are blue. A private company operates red buses that wait outside the train station and charge 2 euros for the same route as number 5. Glowing Toledo Cathedral tower from the cobble streets at night. The Cathedral is the centrepiece of Toledo. It sits on top of the hill and is deceptively large. When you enter you will be confronted by sparkling gold reliefs, huge oil paintings and portraits of all of the Toledo Cardinals going back at least 500 years. The baroque Transparente, behind the main altar, is like nothing you have ever seen. The Cathedral also has a great art gallery with works by Raphael, Rubens, Goya, Titian, and one of El Greco's major works, The Disrobing of Christ. They now charge an outrageous 10€ to visit the cathedral but will not allow you to take flash photographs. There is a tour of the bell tower offered once an hour for an additional fee. The second of Toledo's remaining pre-16th century synagogues, the Sinagoga El Transito hosts the Sefardi Museum. The Alcazar is a large square building on the outskirts of the old city. It looks across the river at Franco's old military barracks. The origin of the building dates back to the presence of a Roman camp in the IIIrd century. The Muslims built there a keep transformed later by Alfonso VI and Alfonso X, which was the first Alcazar. Get lost. Take some time to lose yourself in Toledo's medieval streets. The city is surrounded by the River Tajo on three sides and two medieval walls on the fourth side. The old city is relatively small and can be crossed in 45 minutes, so you are never too far from the center. When you want to head back, just head uphill and you are virtually guaranteed to end up at the main plaza, Plaza de Zocodover. There is a "Land Train" operating from the centre of the town. A good way to look around, particularly if you can't walk too far. The gold and black enamel work by local artisans is known throughout Spain. Many shops in Toledo sell decorated plates, shields, spoons and key rings. Sword - Toledo is well known for its swords, so be sure to look for a conquistador sword, which should set you back around US $300. As you can't bring it on a plane, you'll need to send it. Fortunately, many shops will ship it for you for a reasonable price. Ceramics - Talavera de la Reina (outside of Toledo) has a centuries-old tradition of glazed ceramics. Toledo is filled with handpainted ceramics of varying degrees of quality (upscale shops and boutiques are pricier, but generally carry higher-quality pieces). Damascene - Another famous handicraft of Toledo is damascene, from the ancient Moorish art of interlacing gold on iron or steel, then firing it so the underlying material oxidizes and becomes black, with the gold in sharp relief. Every shop in Toledo will carry some form of damascene work, most frequently as small decorative plates and jewellery. Damascene also tends to be on the expensive side, so be sure to comparison shop around Toledo. The traditional manufacturing process consists of several steps, as it is shown in MadeInToledo.com . The region around Toledo and southward in Castilla La Mancha produces typical almond sweets known as Mazapán, which is not to be confused with the Scandinavian almond paste called "marzipan". Mazapán is glazed, and sometimes decorated with pine nuts (piñones). The most famous bakery making this sweet in all of Spain is arguably the Confiteria Santo Tomé  (web-site only in Spanish), which is particularly crowded just before Christmas when shoppers from all over Spain come to Toledo to buy some Mazapán for their Christmas parties. Another good Italian place is Mille Grazie, just off Zocodover. Lots of charm with exposed brick walls. Great pasta and pizza, and a very attentive staff. Fills up pretty quickly at dinner. Closed Mondays. Try Picaro or Circulo de Arte for a hip night scene, Circulo de Arte is in a renovated church and plays good dance music. It also has some of the best batidos (milkshakes) in town! O´Brian's serves good tap beer, and boasts a strong tourist and student crowd most nights. Casona de la Reina[] C/ Armas, 12 45001 Toledo. 925 282 052 Clean & classy hotel. Priced quite reasonably. Located on the river for impressive views but an up hill climb to through the city. Park on the street if available or on site garage. Incredible breakfast is included. WIFI works great. Parador de Toledo, . This hotel offers the best views of the town. Toledo is a relatively small town, and so is rather safe. 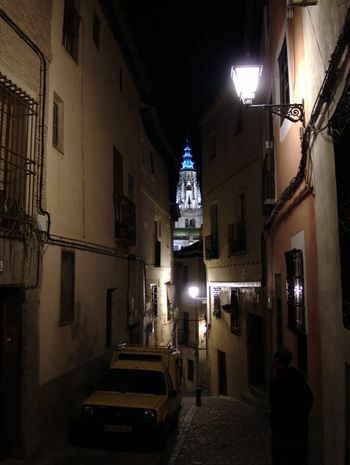 Toledo's medieval streets are labyrinthine, so the biggest danger is getting lost, especially at night. 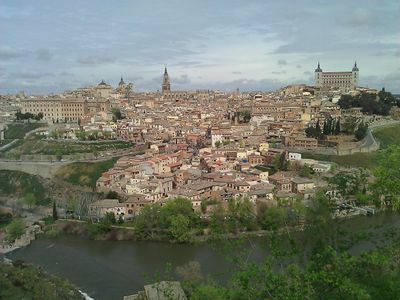 Due to the location of Toledo upon the top of a hill, the city is exposed to quite a bit of sunshine in comparison to Madrid. Therefore the average temperature you sense may be considerably higher than what you would expect from the forecast. Temperatures can be in the high 30´s (100F) as late as nine in the evening. Be sure to bring plenty of water or get some refreshments in Toledo to support the local shopkeepers. Do not forget to put on sufficient sunblock on a hot summer day or try to stay in the shades of buildings and trees. 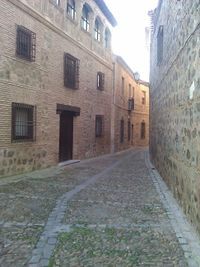 The historic center of Toledo is rather steep and hilly and most streets are cobblestone, so sensible shoes are a must. This page was last edited on 2 March 2017, at 09:30.